Viking wall on Newfoundland. Working with stone is an ubiquitous Neothithic phenomenon. 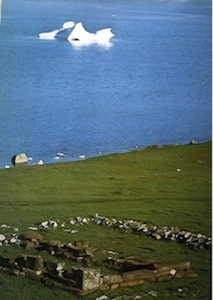 Image from book ‘Mysteries of the Past, ‘by American Heritage. A stone wall can bring history alive for students, who might just like an excuse to be outdoors. 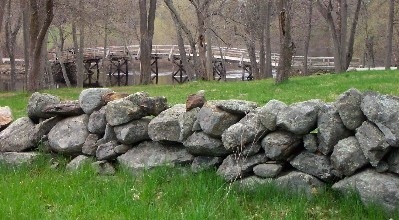 Most students, by the time they reach middle school, have come to realize that old stone walls were built by early New Englanders. But very few students few (especially urban ones) have made the connection between the physical presence of the walls and the abstractions of their history books. Making this connection can bring history alive as compellingly as dressing in a colonial costume. Ask them to research “Old World” and “New World” walls and see if they come up with commonalities and differences. The picture above would suggest more of the former. Forest growth prior to European contact. Forest clearing by early settlers, peaking in the middle 19th century. Agricultural activity and the emergence of stone in the generations that followed. Building of the wall when enough stone accumulated. Walking away from the wall, when farms were abandoned, causing regrowth of the trees, disintegration of the wall, and weathering. Re-occupation of the woodlands during the rise of modern ruburbia and suburbia. Building time. A wall is like a clock for millennial time. For every particular place, knowing the era of town settlement and the era when the farms were being abandoned gives them an approximate number to work with. Let’s take the town of Mansfield CT, settled right about 1700 and largely abandoned for agriculture about the time of the civil War. This give us these dates. This gives us these durations between the dates above. This means that that the duration of wall building approximates the lapse of time since abandonment. Can all this be plugged into the American History lessons? Ask them who built the walls, then take it from there. Slaves? Indians? Prisoners? Farmers? Men? Women? Probably the most important stone wall in America, at the Old Manse, Concord MA.